Operating twenty-four hours a day, 365 days a year, We at your loved one’s service at all times. Not only do we feel we are the best senior in home care provider, but the people of San Diego County have voted 24 Hour Home Care as the best home care agency for the past several years running. 24 Hour Home Care’s Encinitas office leads the industry with top-notch customer service and care that your loved one deserves. Our office is accessible 24/7, giving you peace of mind that you will always be able to access one of our care team members. 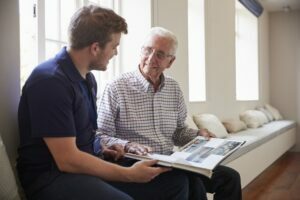 During a free in-home consultation, a care plan will be carefully crafted for each of our clients based on their specific needs, allowing them to age happily and safely in the comfort of their own home. Our caregivers can provide meal preparation, medication reminders, personal care and companionship. All caregivers employed with 24 Hour Home Care have gone through our extensive Signature Specialty Training’s including Alzheimer’s and Dementia, fall prevention and American Red Cross emergency preparedness training. By combining legendary customer service, innovation, and cutting edge technologies, the San Diego Office will provide your loved one with opportunity to remain comfortably at home, and you with peace of mind. Call (858) 529-6230 and see what the San Diego Office can do for your entire family today!